I had completely forgotten that I planted this hot pink peony bush last year. What a nice surprise it turned out to be last week! We’ve got a very busy weekend coming up. 1 birthday party, 1 baby shower, 1 college graduation party and 2 high school graduation parties. Whew! Potential! You’ll show us the resulting flower, right? You can tell the time of year by the itinerary. Have fun! WOW…you are going to be very busy! Have fun! 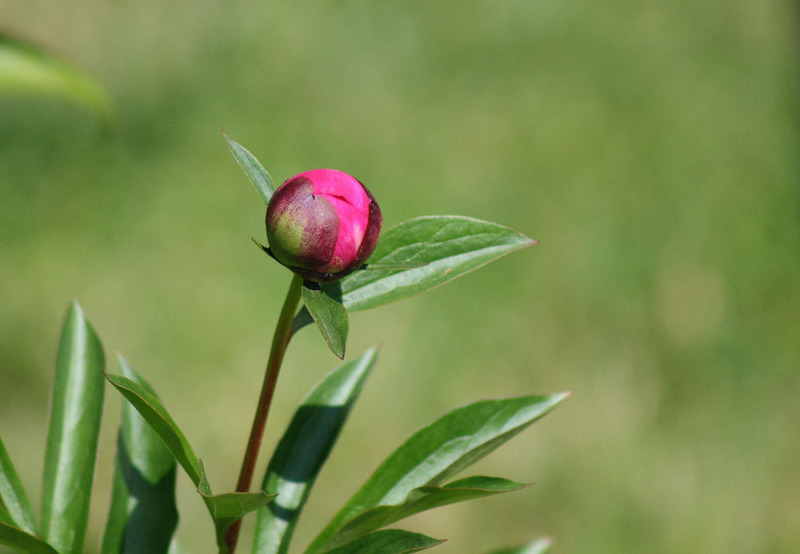 Peonies are such cheerful little ladies. We have a coral and a couple of pinks in the yard. I love when they pop! I love your peony! I have exactly the same one in a vase with some others in my living room at the moment (here in the UK I’m not as fortunate as you to be able togrow them in a balmy climate). Whoa – that’s a lot of partying! Enjoy it all. And that’s a lovely peony; such a pretty color! Can’t wait to see the “finished object” (the flower. That is my most favorite of all colors…I just got a dress that color to wear to a wedding next Saturday and I am whipping up a quick wrap from some gorgeous stash yarn to go with it. I loved the yarn and knew the right project would present itself…and how glad I am that I waited to knit with it, cause it is perfect with my dress! I love when things work out that way. Have a great, busy weekend. My mom gave me a peony several years back and I don’t remember it blooming the first year. It’s now in full bloom, yellow. I am planting some more tomorrow and they’re dark pink. I love them and this is a very nice picture! Have a great time at the parties! A party for every occasion! Have a wonderful week! I have the exact same color – two bushes. Not quite that far along. I can’t wait until they bloom! So decadent! Sounds like a great weekend. I hope that you have tons of fun. What a nice surprise! Is it in full bloom yet? Pace yourself, sweetie. You don’t want to be all partied out by Monday. Have fun on this busy week-end!!! Those are my favorite flower, unfortunately I live on a sand dune and can’t get mine to blossom even after 6 years of trying. That’s going to be gorgeous! Peonies are among my favorite flowers, we can’t grow them where I live as it doesn’t get cold enough. My Uncle has a peony garden ( he is a botanical artist). Hope you do show the flower is full bloom, I’ll bet it will be something to see. Can’t wait to see the peony fully blossomed! Looks like it’ll be a beauty! Thanks for being such an inspiration, I love reading your blog!